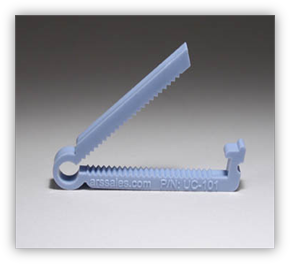 Umbilical Clamps can be used when it is necessary to cut the umbilical cord. In some cases, the umbilical cord does not break naturally, or may need to be cut before it can break naturally. An umbilical clamp will prevent the umbilical stump from bleeding excessively and help prevent navel infection in these situations. Can be used as an alternative to umbilical tape. Sold in bags of 10.